Bienvenidos a la Mision Chile Santiago Norte! We love the Savior, and are blessed to be part of this great work, to share His gospel, and invite others to come unto Him. We are grateful to have this incredible opportunity to associate with such fine young men and women and other couples who are serving in this wonderful part of the vineyard. We decided to share this mission through a blog, with any who would like to know more.... All of the lessons, talks, training, conferences, and meetings are obviously done totally in Spanish, but for the sake of this writer, the notes are here in English, for speed in typing, and therefore, mixed with a bit of both worlds. We hope all of our missionaries, families, and loved ones can enjoy this blog, in spite of the writing, grammar, language, errors, etc. This will be a miraculous journey, and we invite you to share and enjoy it with us. A Simple act of Service....these great missionaries! And by very small means the Lord … bringeth about the salvation of many souls” (Alma 37:6-7). Thank you for who you are, true disciples of Jesus Christ. One of the challenges that Sister May and I had when we first arrived in Chile was to be able to find the different chapels to attend meetings such as zone conferences, zone classes, Sunday meetings, etc. We had the blessing to have Elders Stewart and Rodriguez as assistants when we first arrived. Elder Stewart had studied arquitecture before the mission and was talented at drawing. He was able to draw maps that were very helpful to get to where we need to go. To use a GPS, you must turn it on before you start on your trip. You must enter the name of the place where you want to go. As you begin to travel, a voice from the GPS will give you instructions along the way to guide you to where you need to go. It will indicate to you where you need to turn, how close you are to your final destination, etc. An interesting aspect of a GPS is that if you do not obey the instructions given by the GPS, it will automatically recalculate a new and alternate route to your final destination based on where you are as a result of not following the original instructions. Another interesting aspect of the GPS is you can adjust the volume of the voice of the GPS to different levels which remain constant regardless of whether we follow the instructions given. One of God´s greatest gifts He has for us, His children, is the gift of the Holy Ghost. It is our own GPS and it “will show unto you all things what ye should do” (2 Nephi 32:5). It will be the source of power for learning and teach. It will comfort us in time of trial and sorrow. The Holy Ghost will warn of us of both physical and spiritual danger. It testifies of Jesus Christ and helps us recognize truth. We can feel God´s love, guidance and direction in our lives. Faith in Christ includes having confidence in the mission and power of the Holy Ghost and that we can receive answers to our prayer and personal revelation and inspiration to guide us in our lives. There is one very big difference between the gift of the Holy Ghost and a GPS. The volume of the voice of the GPS does not fluctuate according the degree we obey it´s instructions, the volume remains constant. When we use our free agency to choose to disregard the promptings of the Holy Ghost, it´s influence will diminish. In other words, the volume by which the Holy Ghost prompts us and influences will gradually decrease over time. It can be like a sunset, gradually decreasing until we are in darkness. We then become subject to another influence, “and the awfulness of yielding to the enticings of that cunning one” (2 Nephi 9:39). The good news is that if we fail to following the promptings of the Holy Ghost, we have a way to recalculate our course as does the GPS. It is called repentance. Repentance includes forming a fresh view of God, ourselves, the world and others. It brings our will in line with the Lord´s will. It brings the forgiveness and peace of the Lord into our lives. Our guilt and sorrow are swept away. We will be able to qualify to return to live with our Heavenly Father and His Son. We will feel the Spirit in greater abundance. We as missionaries are called to teach by the Spirit “and the Spirit shall be given unto you by the prayer of faith; and if ye receive not the Spirit ye shall not teach” (D&C 42:14). It is my prayer that we will do all that we can to have influence of the Holy Ghost into our lives so that we can be powerful instruments in the Lord´s hands to bring many of His children to the knowledge of the truth. What is our motive for being Obedient? 1. Avoid punishment (Good Reason). 2. Receive blessings (Better Reason). 3. Love for the Lord (Best Reason). “And it came to pass that my father did speak unto them in the valley of Lemuel, with power, being filled with the Spirit, until their frames did shake before him. And he did confound them, that they durst not utter against him; wherefore, they did as he commanded them” (1 Nephi 2:14). “And it came to pass that the Lord was with us, yea, even the voice of the Lord came and did speak many words unto them, and did chasten them exceedingly; and after they were chastened by the voice of the Lord they did turn away their anger, and did repent of their sins…”(1 Nephi 16:39). “And inasmuch as ye shall keep my commandments, ye shall prosper, and shall be led to a land of promise; yea, even a land which I have prepared for you; yea, a land which is choice above all other lands” (1 Nephi 2:20). Nephi is a great example of being motivated by love for the Lord (Best Reason). Behold, he hath heard my cry by day, and he hath given me knowledge by visions in the night-time. O Lord, I have trusted in thee, and I will trust in thee forever. I will not put my trust in the arm of flesh; for I know that cursed is he that putteth his trust in the arm of flesh. Yea, cursed is he that putteth his trust in man or maketh flesh his arm. May our love for Heavenly Father and His Son Jesus Christ be our motivation all that we seek to become and all we do. We asked any of the missionaries who also wanted to be included in the 'mission quilt' to donate the smaller, short, tiny tip of one of their ties of choice. They made it up with quite the fanfare, and had tie-cutting moments that were hilarious to see. We realize that our lives will ALWAYS be 'tied' together, after serving and loving one another here in the Chile Santiago North Mission. See the fotos also attached. Am I ready and qualify to teach at the MTC? - Can effectively teach and help missionaries fulfill the purpose of their call. Please ask yourself, "Would I want this missionary teaching the missionaries who will come to me from the MTC?" Do I love the Lord and sincerely testify of Him? Do I have a vision of missionary work and demonstrate the principles of Preach My Gospel? Am I humble, teachable, and receptive to feedback? Am I responsible, dependable, and truly obedient? Can I effectively teach and help missionaries to fulfill the purpose of their call? I invite each of us to evaluate ourselves by reviewing these questions and setting goals and making plans to become the missionaries the Lord expects us to become so that we can bring many souls unto Him. Please feel free to share with me your goals and plans and your progress in your weekly letters in the future. In our prayers at the end of the day, do we give an accounting of our work to the Lord? Do we feel personal responsibility for the sacred trust the Lord has given us? It is my prayer that we will be fruitful servants of the Lord in bringing souls to Him through faith in Jesus Christ and His Atonement, repentance, baptism, receiving the Holy Ghost and enduring to the end. Fotos of parents walking their children to the private girls' school near the mission home, show loving gestures of mothers and fathers in their daughters' lives! Met with the missionaries in San Felipe chapel from Los Andes zone, during their zone/district classes. They are marvavillosos! 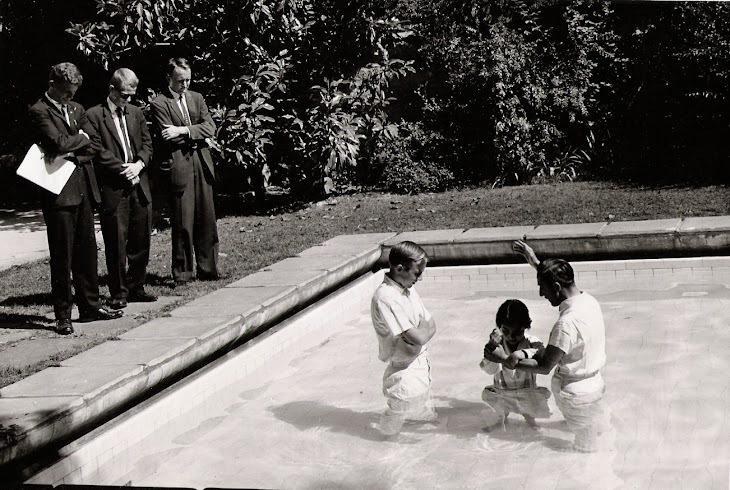 Baptism in the Mission home swimming pool! Pdte Correa y familia (Quilicura Stake) bring Huaso/cowboy hat and manto for Pdte May! These to remind us all of prices, remember 500 = $1.00 but this is for a LITER!!!! Claudio Contreras – Recent Convert – told us that he has always known that the church was true, and doing baptisms for the dead just confirmed it more. Maricell Contreras – Recent Convert –She just wanted to observe the baptisms but half way through the baptismal session, Hermana Taylor thought she needed something. So she asked her in English, which Maricell didn’t understand, if she wanted to participate. She replied in Spanish, which Hermana Taylor didn’t understand, that she did. She did confirmations. After the session while waiting for our party to gather all together, a returned missionary from the south, just walked up to her and pointed to a scripture in 3 Nephi and she read it. She told us that it answered a question that she had. She didn’t know the missionary and he didn’t know her. She told us that her testimony has grown so much more being in the temple and doing confirmations. Maria Paz Bruno – Recent Convert – Thought it was a wonderful tour and really loved it and even her 15 year old son who she didn’t think would like it, thought it was very good. The little kids liked it too. Maria was very impressed with the love that the Savior has for us and asked a lot of questions about being sealed in the temple. She wants to bring her non-member husband on the tour. She really wants to go to the temple and be sealed to her family. During the tour there was a picture of the Savior coming out of the tomb. Maria really felt the spirit with that picture. Then we talked about the picture of Joseph Smith seeing God the Father and his son. The little non-member neighbor boy that came with us, told the sisters all about that picture. (He is about 8 or 9 years old). Me siento muy feliz creo que estoy todo bien, y esta visita confirma lo que estoy pensando, gracias a todos por ayudarme en este camino. Perseverare hasta el fin Amo Cristo y al Padre celestial. I feel very happy I believe that I am doing well, this visit confirmed what I was thinking. Thanks to all for helping me in this path. I will endure to the end. I love Christ and Heavenly Father. Franco 9 year old Non Member –Alegría sentí, mucha confianza en Dios sentí que el puede hacer todo solamente hay que confiar. I felt joy and a lot of confidence in God that he can do everything we only have to have confidence in him. Mathias Recent Convert – Me sentí alegre de mi visita porfin conoci el templo o la casa del señor y el video fue muy emocionante y alegre ojala pueda visitar el templo otro dia. I felt joy to finally get to know the temple or the house of the Lord. And the video was very emotional and joyful. I hope to visit the temple another day. Lucas – Recent Convert – Demasiado feliz por el video que vimos y por esta visita al templo. Very happy for the video that we saw and for this visit to the temple. Teresa – Non Member – (Mother of Sonia and Sussan); Me gustó mucho el recorrido, me trae paz y tranquilidad, me gustó mucho como la hermana Blackham explica sobre lo que Jesucristo tiene para nosotros, que es el gran amor intenso. I liked very much the memory, it brought peace and tranquility. I liked very much how Sister Blackham explained what Jesus Christ did for us, which is his great intense love. Sonia – Recent Convert – El recorrido estuvo muy bueno pues me sentí como en casa, llena de paz, júbilo, y saber que así será nuestra casa cuando estemos con nuestro padre celestial es muy hermoso. Y felicito a la hermana Blackham y lo que nos mostró.The memory was very good, I felt like I was at home, filled with peace, jubilee and I know that this will be like our house when we are with our Heavenly Father, it is very beautiful. I congratulate Sister Blackham and what she showed us. Sussan – Recent Convert – Cuando entré a la iglesia tuve un sentimiento de paz, tranquilidad. Y el recorrido que nos dio la hermana Blackham fue muy bueno. When I entered the church, I felt a feeling of peace and tranquility. And the memory that Sister Blackham gave us was very good. Maricell – Recent Convert – Al visitar los aldredores del templo se siente tranquilidad y paz. Me faltan solo 6 meses para poder entrar en el templo y sellarme con mi esposo y mi hija y creo que va a ser aldo increíble, maravilloso. Solo espero aprender a amar y servir. Me falta mucho todavía. As I visited the surroundings of the temple, I felt tranquility and peace. I only have 6 months left until I can enter the temple and be sealed to my husband and daughter. I believe that it will be incredible and marvelous. I only hope to learn to love and serve. I still lack much. Claudio – Recent Convert – Este recorrido me puso felíz, siento que éste es la iglesia verdadera. Sé que José Smith fue la persona que se congració con el Señor para restaurar ésta maravillosa obra. Espero poder llegar a sellarnos en la iglesia con mi familia.This memory caused me to be happy; I feel that this is the true church. I know that Joseph Smith was the person chosen by the Lord to restore this marvelous work. I hope that I can come and be sealed in the church with my family. Hermana Taylor – Missionary – I really feel the Spirit when we go on the tour. I cry every time I see the video. I feel the Savior’s love for me and for others. I also feel a greater love for my fellowmen. Thanks for the tour. Janette – Recent Convert – Me encantó mucho la obra misional. No tengo palabras, como agradecer lo que Dios he hecho por mi vida… infinitamente él tiene grandes propósitos y Amor por nuestras vidas. Con amor, infinito, Amén.I very much love missionary work. I don’t have words to express my gratitude for what God has done in my life. Infinitely, He has great purposes and love for our lives. With infinite love, Amen. Janette – Non Member – (mother of Janette); Me siento grata de estar en el templo del Señor yo que sentí que la Iglesia de Jesucristo es verdadera porque tiene una doctrina y que me hizo sentir alegre. I feel grateful to be in the temple of the Lord. I feel that the Church of Jesus Christ is true because it has a doctrine that makes me feel happy. Carolina Valdenegro – Member – (Grandmother of Carolina & Nayareth); Yo vine por la fe que tengo en mi dios y su hijo Jesucristo. I came because of the faith that I have in God and his Son Jesus Christ. Carolina Miranda – Non Member – (She was baptized one week later); En este recorrido me sentí muy alegre y con mucha paz gozo y tranquilidad además la iglesia es muy bonita y acogedora, las personas muy alegres y todos muy agradables. In this visit I felt very happy with much peace and joy and tranquility; also the church is very pretty. The people are very happy and very pleasant. Nayareth Nicole – Recent Convert – Lo encontré super bonito no solamente la estructura si no espiritualmente y me sentí con alegría paz y bien acompañada. I found it very pretty, not only the structure, but the spirit and I felt happiness, peace and good company. Alejandra – Recient Convert (less than one week) – Me siento muy agradecida por la invitación que he recibido a conocer el templo y muy emocionada ya que gracias a entrar aquí me doy cuenta de que soy muy bendecida por Dios y que realmente el nos ama. Muchas gracias por enseñarnos más sobre el evangelio. I felt very grateful for the invitation that I received to get to know the temple; very emotional. I m grateful to enter here, I am aware that I am very blessed of God and that He really loves us. Thank you very much for teaching us more about the gospel. Jahiro – Recient Reactivated Member (Alejandra’s fiance) – Esta ha sido una de las experiencias más lindas que he tenido, sé que me fortalecerá en mi vida. Y me servirá mucho en mi vivir. Gracias por el recorrido. This has been one of the most beautiful experiences that I have had, I know that it will fortify me in my live and that it will bless me much in my life. Thanks for the memory. Note: After Alejandra and Jahiro left the temple they said that they were going to return in one year and get sealed. Megan – Age 14 – I felt really good being here today getting to see all around the place. Robin – Age 12 – My thoughts about being here today were excited and a little bit nervous because of the languages, but my parents told me to listen to the Spirit. John – Age 9 – I feel like I can do anything. Stir all together and drop by spoonfuls onto aluminum foil or wax paper on counter top. Let cool and set up to firm, if you can WAIT before eating them! "Now my dear young friends, missionary work is not easy. In fact, it is often quite difficult, but the Lord is the greatest paymaster in the world. Dedicated missionary service is one of life's most fulfilling experiences. This is in large measure because of the divine agency which flows so richly from the Lord to His humble and obedient servants to bless the lives of others. I know this because I have seen it manifested in the lives of thousands and have felt it in my own life." Sometimes they look at it like you just handed them a $500 dollar bill, and they are not used to seeing those much and don’t like to make change! No one is really used to tipping here, so you can just leave something VERY small and they still like that.--Don’t spend it all in one place! LES AMAMOS, Elderes y Hermanas!